The call for nominations for SIAM prizes opened on May 1, as announced by the A3 poster included with last month’s SIAM News. The open prizes range from student and early-career prizes to awards recognizing lifetime achievements. Why are prizes important, and why should you make a nomination? I see three main reasons. First, prizes recognize and reward outstanding accomplishments, bringing honor to the recipients and their departments and institutions. Second, they demonstrate the importance of their field (and of applied mathematics in general) to everyone from administrators to funders to potential graduate students. Third, they help advance careers, especially for early career researchers, and can be stepping stones to further success. In order to function successfully, prizes need a reasonable number of nominations. SIAM’s prize policy requires a prize to receive a minimum of three new nominations in response to an open call in order for the prize to be awarded, and it directs that a prize be terminated if it fails to achieve this minimum for two consecutive cycles. The message it clear: if a prize is valued, the relevant community should ensure that nominations are made, or the prize could be lost. Ideally, one would hope for two to three times the minimum number of nominations. Additionally, the nominations for a healthy prize should reflect the pool of eligible candidates, in terms of subject area, gender, affiliation (university, lab, or industry), geography, and underrepresented groups. Ensuring diversity of the nominations helps to produce diversity in prize winners. Prize committees, which select winners, are appointed by the president, or for SIAM Activity Group (SIAG) prizes, by the SIAG with the approval of the vice president at large. In my experience, colleagues are generous in volunteering their time to serve on prize committees and regard it as an honor to be asked. Administering SIAM’s 14 major prizes and 25 SIAG prizes is a significant task. It involves issuing prize calls; forming selection committees; collecting nominations (including rollovers from previous cycles) and checking eligibilities; communicating this information to the committees (hundreds of files are in play in any given year); getting recommendations approved; and notifying winners. SIAM recently invested in prize management software to streamline these processes. The software provides a better way for selection committees to access nominations, offers easy reporting of relevant statistics, and will ultimately save staff time. The vice president at large—currently Ilse Ipsen—and the Major Awards Committee oversee the SIAM Prize Program. One thing I learned during my time as vice president at large (2010-2013) is that there is always work to do on prizes: tweaking specifications, considering proposals for new prizes, and so on. This year, we have been revising conflict of interest guidelines for prize selection committees in order to clarify what constitutes a conflict and how to handle one. The new guidelines will go to the Council for approval at the 2017 Annual Meeting in Pittsburgh, Pa., this July. Some prizes have an associated lecture, which provides an opportunity for a conference audience to hear the winner speak about his or her work. A prime example is the John von Neumann Lecture, SIAM’s premier award. At the 2016 Annual Meeting in Boston, Mass., last year’s winner, Donald Knuth, gave a spellbinding lecture on the satisfiability problem. Recordings of many of these prize lectures are available on SIAM Presents, which also contains recorded plenary invited talks and minisymposia from select SIAM conferences — most recently from the 2017 SIAM Conference on Computational Science and Engineering. I encourage readers to make use of this excellent resource. 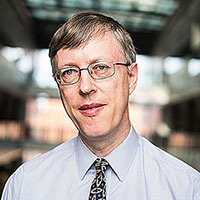 Nicholas Higham is the Richardson Professor of Applied Mathematics at the University of Manchester. He is the current president of SIAM.